The most romantic day of the year is nearly upon us, and what better way to say 'I love you' than with flowers. 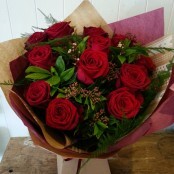 Here at Flowersmiths we can create a variety of floral arrangements to suit your needs, from beautiful single red roses to lavish lily and rose arrangements, from simple rustic posies to spectacular tropical flower bouquets. Our team of friendly and talented staff are here to help make this a special Valentines day for you and your loved one. All our flowers are available for delivery in the Bolton, Horwich, Blackrod and Adlington areas. For any extra queries please call us on 01204 697924.